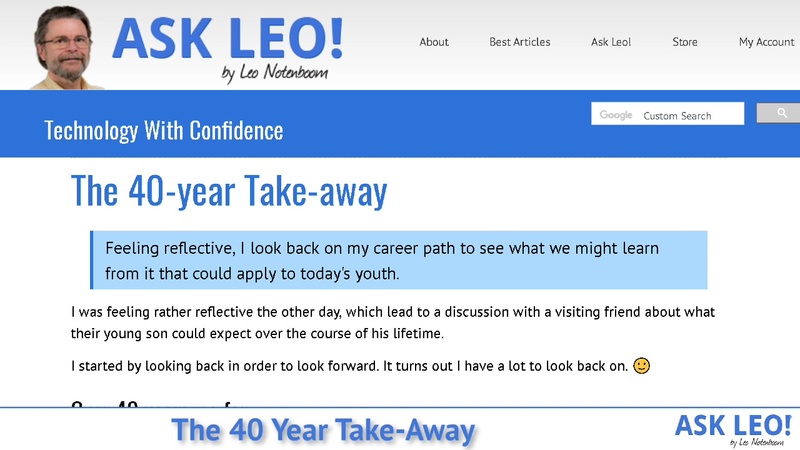 The 40-year Take-away - Ask Leo! Feeling reflective, I look back on my career path to see what we might learn from it that could apply to today's youth. I first encountered a computer in 1976, and as I’ve discussed elsewhere, it was love at first sight. That this could be a career thrilled me. It’s a long list, and I had to gloss over more than a few things to make it as short as it is. Hidden in that list is something I believe is incredibly important. There’s nothing at the bottom of the list that could have been reliably predicted by what’s at the top. Put another way, there’s absolutely no way I could have known in 1976 what my work in 2018 would entail, other than the very vague terms “computers” and “technology”. Things are moving too quickly, and in directions that we simply can’t guess, in order to make long-term predictions, much less long-term commitments. And here’s another implied take-away: it’s not going to stop. In eras past, we could easily train for a job, skill, or career at a young age, do that same job for the majority of our working lives, and retire at some point. One job, one skill, was all you needed for your entire life. As long as you were good at it, it was something you could count on to keep you active, feed your family, and meet your needs. More importantly, perhaps, it’s no longer true for the majority of careers, not just those directly involved in technology. You see it all around you — as technologies change, the underlying infrastructure changes as well. The clearest example might be coal mining. As energy production moves to cleaner and more efficient sources, the need to dig black rock out of the ground is declining. If they want to remain productive, individuals involved in that effort need to discover new skills and new careers. You can no longer count on being able to do the same job until you die. To bring this back to my friend’s young child, this means that exactly what he learns to do as a job or skill after high school or college is less important now than it ever was, simply because you can be certain that it will likely change significantly. And the implications of such a change can be dramatic. What if your doctor is offering advice that has been rendered obsolete since they finished medical school? Knowledge changes. What were once accepted facts are continually updated, refined, or replaced as new information, technologies, and tools become available. It’s no longer enough to go to school and get a job. You need to stay in school for the rest of your life. You can never stop learning. My friends were pushing their child to become a doctor. My position? Besides “don’t push” (let the child decide for himself what his calling should be), my advice is to focus those energies elsewhere. Focus, instead, on learning how to learn, learning how to question, and learning how to fail and benefit from it. I won’t say that what someone chooses to focus on today is irrelevant; it’s not. My first encounter with punch cards in 1976 set a chain of events in motion that led me to my current situation. But the chain of events is more important than the choice of punch-card technology. At each step along the way I had to learn something new. I had to learn how to solve problems I’d never encountered before. I had to learn how to question and re-evaluate previously accepted wisdom. I had to learn how to fail, and I had to learn how to take away important lessons from each failure. All of that led to something completely unpredictable: today. My 40-year take-away? 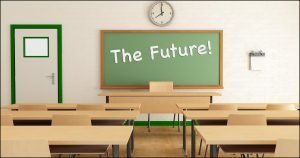 Teach your children how to learn, so they can be ready for a future you can’t even begin to imagine. Are Humans Getting More Stupid Because of Computers? - Computers make many things easier. Personally, I can do and be more than ever before. It’s because I allow the technology to help with many of the things that I used to have to remember or know... freeing up my time for other things. « Previous post: How Do I Unsubscribe from All These Unwanted Emails? Right on – who knew what the future would hold? My first job in the computer industry was with a small start-up called Control Data Corporation, and their computers (1604, 3600, etc) were big enough to stand in. Today my cell phone has more technology in it. What’s next? I enjoy your column – always something of interest for an old guy like me. That was my first computer in college too. I remember we’d constantly try hacking it to crash the system and do other stuff we weren’t supposed to. The card system made it completely anonymous. You said it! I joined the USAF after high school in 1960. After ten years, I got out and started computer work using the punch card, as well. I went back to school to learn computer technology. Before I received my Associates Degree in Technology I got a job with DataPoint Corporation. DataPoint was the originator of the desktop computer: the DataPoint 2200. It had a cassette-based operating system, a whopping 16K of internal RAM and each unit sold for over $30,000. And look where we are now. I have gone on to get both my Bachelors and Masters degrees in computer technology. I have always said: “Education is a journey; not a destination.” I’m 76 now and still learning. Keep up the good work and keep those messages coming. Bill I started my IT career in 1982 in South Africa at a manufacturing company that had a Datapoint. The first language I learned was Databus… I cannot remember where the word Arc fit in but it rings a huge bell. Thanks for the memories! I had to learn how to fail, and I had to learn how to take away important lessons from each failure. Imagine how different your life would have been if you were better at hexadecimal math and got that job. I rarely used hexadecimal math. I bought a Casio hexadecimal capable calculator instead 🙂 . Just saying that sometimes our failures are successes in disguise. Here’s an attempt in the early 20th century to predict Y2K. They got the Roomba and a few other things right. We don’t know what the future job market will look like, but we do know some of the skills that will be needed: entrepreneurship, adaptability, problem solving, communication, the ability to negotiate and collaborate, curiosity and imagination. And the development of these skills is something our education systems should be placing more emphasis on developing. I am 82 y.o psychiatrist and still working (part time), learning every day. Your ideas about continuous learning and questions about the future i sent to my many friends and colleagues. As a fellow dinosaur (also started on punch cards and paper tape), I would like to offer some more general advice. Don’t waste the best years of your life waiting for the best years of your life. Learn to learn. Really good advice. I see so many now that learning seemed to revolve on test taking, thus not really learning how to survive. I did 4 navy years (sonar tech) after high school then went to U. Temple CC and got my AAS in Electronic Engineering, ending up at Bell Labs in research. I spent 35 years there, constantly learning new technologies. I didn’t actually further my degree, but took many courses over the years, including a number of masters level versions. The environment required that to survive. I retired in 2001 as a Member of Technical Staff and over those years worked with some of the brightest people. Today I still try to keep up with what is happening, though it gets harder each year. But I try to learn something new as often as I can. My advice to young people – learn something new every day. My first computer ran CP/M software and was used as a bulletin board while a bearded Bill Gates (who in their right mind would give this hippy money?) was trying to formulate DOS as an operating system. The BBS had a massive 64 bytes of memory and had “doors”. Those who are under 70 need not bother to even read this message. Self taught and still learning but having trouble “keeping up.” Once had a dictionary sized book with all the DOS commands, and it was years before I would convert to “Windows.” I am a dinosaur in a modern world. I can’t read your comment now. I won’t be old enough to read it for another 364 days 😉 . Thanks for the wisdom, Leo. Too few people take the trouble of imparting wisdom on the current generation built up and aggregated from many years of (sometimes painful) leaning’s. To take the trouble, time and effort to do this speaks volumes about your kindness and care as a human being. Learn to learn and to think. Words to live by for sure. Sadly, more and more a lost skill. But I can’t believe how young you all are. I first learned programming on an RPC9000 made by the Royal Typewriter Corp. That was around 1959-60. In January 1964 I began programming on an NCR315 computer which had 10k of memory. You entered programs on punched cards which were fed into a system that changed the input to output cards that could then be fed into the computer and executed (one program at a time). The next USAF assignment was a 5 year stint at the Military Personnel center. We created a program that controlled all military personnel activities at base level throughout the world. Next was a 3 year stint at Hq Pacific Command in Hawaii. Next was military retirement followed by a 20 year stint as a programmer for a military contractor. Next was retirement with Social Security but I still write an occasional program using Visual Basic. But… it could! All it would take is a series of EMP’s world wide and we’d be essentially back in the dark ages. And then what would all the snowflakes be able to do then? Unlikely? Yes. Improbable… unfortunately no. Actually that would simply be a reboot. Change and the need to keep learning would simply start over. I started on an IBM 1401 writing Autocoder programs. I was fortunate enough to work on the second IBM360/30. Many Assembler programs followed. DOS system software some came calling and was in the OS side forever. Applications were not to be understood but merely tolerated. My first OS sysgen in 1969 on an IBM360/75 was all in punched cards and occupied 5 trays as I recalled. It took over 4 hours to complete. I managed system software support groups at various and sundry in the early 70s. Began playing with Microsoft based PCs that you had to assemble from a Heath kit in 1980. Most of my groups did both mainframe and PC software in those days. Finally began concentrating on Windows in 1993. Wound up in 2001 leaving the management dodge and learned SQL Server and spent the rest of my career as a DBA (the best years of my career). Finally hung ‘em up in 2014 after 50 years. I still dabble a little in the Windows installation and maintenance areas. I have been a Microsoft Insider for a couple of years and look forward to the new builds (of course I am in the fast track). Most schools have been wrong in their teaching. I had one teacher that taught the way to learn is to teach how to learn, to search, to interpret. Schools teach from a book, learn the book and go on to the next book. It’s already outdated. Imagine learning to milk a goat from a book. Your Computer starts, mine was a Z1000 Sinclare. Well it was portable and did Amateur radio stuff so back in the 80’s, it was under $100 and available. Electronics as a whole has advanced so fast that you need a book to keep up. But the book is already outdated. The one most valuable lesson I ever learnt, came from my father in 1955 when I was starting Secondary school at the age of 11. He said, “You do not go to school to learn that 2 + 2 = 4, you go to school to learn how to learn.” Now at the age of 74, I am still learning. I’m not sure we can instill a desire to keep learning. Some of us are born with limited “vision,” and will never understand that life can be different no matter what we tell them. Then again, I think of myself in the 1980s, in my forties, certain that personal computers are useless, good only for collecting recipes or playing silly games. That changed in one day in 1989 when, in my first day at a new assignment, I was informed one of the most important parts of my job was to produce a weekly report for the battalion commander. (Printed on five sheets of fanfold paper on a dot matrix printer, horizontally, end to end.) Those minutes changed my life. It was sink (get kicked out of the Army) or swim (learn DOS to produce the report). I was lucky to have an office mate, the Signal Officer, ie, not his job to help me, who got me through the first few weeks. Meanwhile, I was studying pirated computer books bought in Seoul book shops and practicing at night on the office computer, bringing it back to life a few times with also-pirated Norton Utilities. inserted from Google Images. Being able to leave the memoir behind has given me much peace of mind. My life’s only regret may be my lost decade, when I stubbornly resisted the coming of this new technology, unable to see its promise. 40 years in one job is starting to seem like a rare thing these days. I’ve spent 43 years, (and counting), in the one full-time job rewinding and redesigning electric motors, generators/alternators and transformers, changing from a time, (1975), when everything from the tiniest fan motor or coil would be rewound, to the ‘modern era’ when it’s not financially viable to rewind a standard 200 H.P. motor. Aside from service jobs, the only motors that tend to get rewound these days are ‘specials’ or the bigger motors, generators and transformers. Luckily enough, Tasmania has a fairly large mining and industrial base to keep the work coming in for the foreseeable future at least. Like Tom Hunn, I’m still learning, and that’s a good thing. As for computers. My first was a ‘Spectravideo 128’ that came with a 28.8 Kb modem that had me fascinated watching a jpeg(?) materialize line by line as it slowly downloaded. The good old days. Congratulations Leo, and thanks for your informative website. We have generations (grandparents, parents and “children”) that all worked in computers, now. Retirees sitting on the porch in rocking chairs is a thing of the past. I started in 1969 on an IBM 360/30 with 32k memory and a dozen big cabinets with peripheral devices and control units. Learning operations, programming and systems design was an empowering and thrilling experiences I ever had. I’m still using computers (and Leo’s Tips) and don’t ever expect to stop. My own first computer system was the 8-bit, 1Mhz, Commodore-64 (which later became a Commodore-128). I still have &use it! Wish I still had my Commodore-64! Also my first; my mom threw it out when we moved (and also my record player 🙁 ). I can sure relate to Steve, above: I was good on that thing – I wish I had realized where the industry was headed – I would have stuck with it! Still learning now, though! First experience was with a Radio Shack TRS-80 with a cassette tape drive and the optional ‘memory chip upgrade’ expanding it to something like 60k. ‘Programming’ was done by copying off sheets of printed data, by hand, into it’s memory. Of course, one typo anywhere in the process screwed the whole thing up. Viewed as a toy? OK. Viewed as a career? Nope. Thanks for all the comments. Let’s discuss what the learning methodology should be that you teach to kids. I got a PhD in artificial intelligence in 1971. In doing that, I certainly learned how to learn, but it took a while. My curriculum through college was always well advanced- I wrote my own degree requirements at each step. The reason I bring this up is that I was well into my MS in Biophysics when I took a course in Probability Theory- I got a “D”. Subsequently I took a course in decision theory. The light went on! From that point on, I didn’t really have to study, even though I took the most difficult courses in science and technology offered at a large university…. The discovery: other than applying decision theory, I began using mind mapping in my head, without forcing what I learned into English. The closest formal concept that mimics this is UML plus mental Petri Net models. I really do think and learn that way. By the way, I have described this as “visual” modelling. If someone isn’t “visual”, then there is a way, through a kind of musical visualization on the auditory cortex to get the same effect. I learned that later in life, when I started singing Black Gospel instructed by a person from a Gullah background. There is no written music, either the music or the words. So we learned the music by repetition. We sang the words, but we didn’t really memorize words. I couldn’t tell you any of the words to any song. But start the music, and the words just come. All this to say I am teaching this way to learn to my grandkids. And I encourage all grandpas and mas out there to teach your grand children to learn, and the way to learn can be found in the key concepts of artificial intelligence. The kids are 9. They are in a Chinese immersion school. Their verbal and head languages haven’t been “locked in” yet. So this way of thinking is just another language to them. It is kind of a language of unlanguage. Some principles: Learning is a conscious effort, but it is not work. Be confident of it- don’t force it into any verbal language. Build yourself a conceptual structure and start hanging concepts and methods on that structure AND, most important, start building relationships between them. Be comfortable with and recognize uncertainty. Remember the uncertainty and add it to your conceptual model. Pay attention to the preconditions: think in Bayesian. No matter how much you “know”, you will have difficulty applying that knowledge without “people skills.” Very few people will get your way of thinking. You will need to learn to translate to their way of thinking and be a teacher in their world. Learn these skills early. The first computer I was involved with was the Illiac 1 (programming) and the Illiac 2 (technician) at the University of Illinois in 1959/1960. The Illiac 1 made use of the Williamson Memory (look that up) made from CRT tubes (1024 bits per tube). The Illiac 1 was constructed using 6SN7 vacuum tubes and discrete components. The Illiac 2 was constructed of those new fangled Transistors. Both of these computers took up half or so of a medium sized building, and the power supplies were in the basement. Wow, 6SN7. That brings back memories. I remember we had to replace that same tube several times on our old Admiral black and white TV in the 50s. I can’t believe I remembered that number when you mentioned it.